This 10” dual-style saddle plate fills the need of customers who have multiple scopes. Often, smaller scopes are outfitted with Vixen V-style dovetail plates; whereas, the larger scopes have the more stable Losmandy D-style plates. The DOVEDV10 is the perfect solution as the best of both worlds. 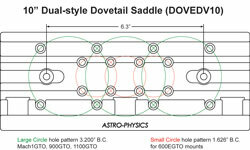 It is a very robust dovetail saddle that will securely attach all your scopes to the mount. The saddle is a three-clamp design that provides the strongest possible lock for both style plates. Using all three clamps will provide extra security, while using one of the end clamps along with the center clamp will allow shorter dovetail plates to be secured. The saddle has the convenience of the Astro-Physics tilt-in feature applicable to both style plates. This tilt-in feature allows scopes to be quickly positioned close to balance without the hassle of sliding a scope’s dovetail in from the end of the saddle. This feature is greatly appreciated when you are struggling with a heavy or awkward scope! The clamping blocks grip your dovetail plate firmly. Springs keep the blocks in an open position until you tighten the knobs. The unique design of the clamping blocks ensures that they remain properly aligned with no need for additional guide pins and the brass washers on the knobs allow firm tightening without binding. This saddle is primarily designed for use with the 400, 600E, Mach1 and Mach2 mounts. It can also be used with the 900 and 1100 mounts when smaller scopes are used (for larger scopes we recommend the 16” DOVELM162). It has additional attachment holes so that the saddle can be shifted forward or backward, depending on whether you are balancing a front-heavy or back-heavy scope. Although the locking knobs have 3/16” hex sockets, there are few times when they need to be used, as hand tightening is normally sufficient. They are intended more for accessibility than force. There is a safety relief machined into the saddle to allow more travel of the dovetail plate when using a ¼”-20 safety screw in the bottom of the dovetail plate. If you are using the 17.25" or longer Losmandy D series dovetails with our 900, Mach1 or Mach2 mounts, we recommend the DOVELM162. The DOVELM162 was designed to use the longer plates on the 900, 1100, 1200 and 1600 mounts. Click the thumbnail for a PDF file that shows the hole position dimensions. Note: This plate replaces the DOVELM2 previously offered.